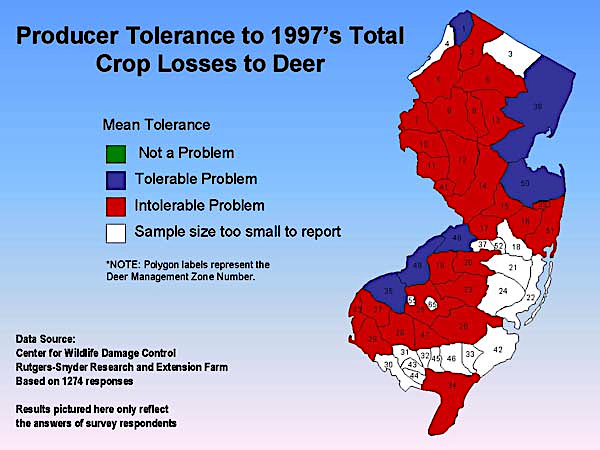 Almost two decades ago, the Rutgers NJAES Center for Wildlife Damage Control Advisory Group surveyed 2,142 New Jersey growers about their experiences dealing with deer damage. 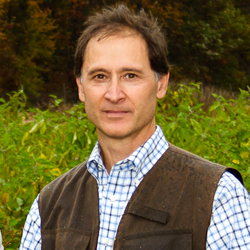 It became clear that growers had some common issues and questions, including: the degree of crop loss due to deer, the need to modify the crops they’re growing and where they’re growing them, increasing time and money dealing with the problem, and increasing conflicts with non-farmer groups that fail to recognize deer impact on farms. As we renew our efforts to better manage the deer populations impacting New Jersey farms, it’s worthwhile reviewing documented perceptions and analysis. Q: What are the crop losses attributable to deer in NJ? Are deer really putting a dent in my yield? A: The economic losses from deer damage to NJ crops continues to be significant. And while as a farmer you recognize deer damage when you see it, you may not realize the full extent of depredation impacting your yields. Singer and Meek have quantified repeated crop defoliation typical of deer browsing damage in soybean: yield reductions occur up to 89% when biomass is removed repeatedly during vegetative and reproductive growth. 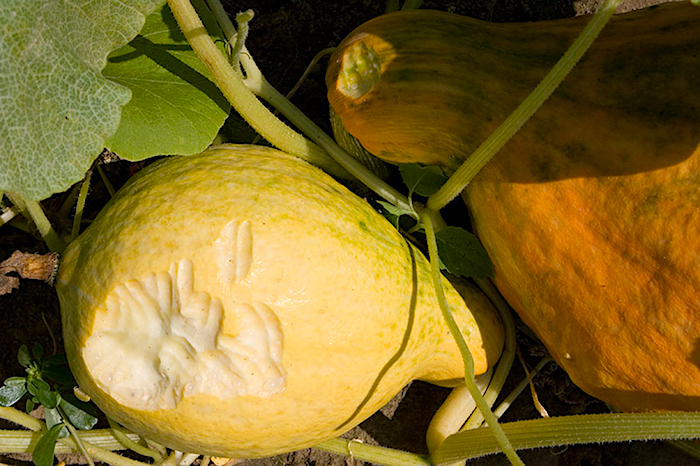 In our survey, NJ growers reported 70% of their crop losses from wildlife were due to deer. Some observers challenged farmers’ ability to visually estimate deer damage levels. 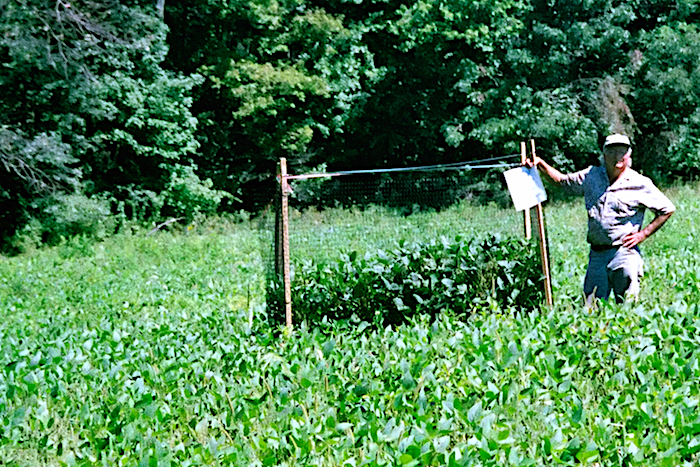 So, as shown in this photo, we constructed deer exclusion fences in a number of farmers’ crop fields. We asked farmers to estimate their level of damage, while at Rutgers NJAES we actually determined damage levels at harvest by measuring yield inside and outside the fence. We found that about half of farmers underestimated their damage and about half equally overestimated. Therefore, with our large farmer respondent sample sizes, in the aggregate, our information presents a good estimation of actual damage levels. Q: I’m thinking about abandoning my fields that border the local park and my neighbors un-hunted woods… or maybe changing crops to something deer don’t like. Are any other growers having to take these steps? A: In our survey of New Jersey growers, 25% reported abandoning a parcel of tillable ground because of excessive deer damage; 36% had ceased growing their preferred crops as a result of excessive damage. In order for our farms to remain sustainable, they must be profitable. Deer damage negatively impacts the sustainability of New Jersey farms. But it is not just individual farmers that are harmed by field abandonment and the loss of preferred crops income. The NJ Department of Ag estimated that in 1997 the estimated value of crops not grown on the 12,596 acres abandoned at $5,385,000. In addition, they estimated the net loss of income for preferred crops no longer planted on 27,596 acres at $2,014,000. Deer damage negatively affects our state economy. Q: The amount of time and money I’m having to spend combating deer is intolerable. Is this common? A: In our survey, New Jersey growers reported that the amount of paid labor hours and dollars they spend annually on attempting to control losses due to deer is significant. Full-time farmers and those rating their crop losses as intolerable reported spending significantly more in labor and materials to fight deer depredation than did part-time farmers or those with more tolerable levels of loss. Q: How can my farm stay in business if I am not able or permitted to control intolerable crop losses? Are other farmers having similar troubles? A: The Governor’s Report on deer damage outlines the various factors contributing to deer over-abundance. Some factors relate to our changing fractured demographic suburban landscape, and others to the differing values residents and society have about deer. When our area was rural and agrarian based, these values conflicts didn’t exist. Each family had a farm or property that they used to produce food and support their families. Owners did what they had to in order to protect their food supply from depredation. Understanding the requirement to protect food supply and farm production in urban fringe farming has been lost by some people who are not close to the land and not longer farm. The need to protect the livelihood products of farms is vital to local farms remaining viable. Urban fringe farmers face these problems daily. The best approaches to solving conflicts include education of landowners, who hold the key to effective wildlife management, and community policy makers. Explain the habits of deer in suburbanized environments, the feasibility of various deer management tools and strategies, impact on their environment, and the benefits of protecting local farms crop losses to strengthen economic sustainability. Local, community-based, integrated approaches can solve conflicts between the needs of wildlife and needs of people. In NJ these approaches are handled by the wildlife professionals at the NJ DEP Division of Fish & Wildlife. NJ passed the Community-based Deer Management Act, partly in response to surveys, pleas from farmers, other land and resource managers, and communities. New Jersey Agricultural Experiment Station. How are White-tailed Deer Affecting Agriculture in New Jersey. DEP, NJ Department of Agriculture. Governor’s Report on Deer Management in New Jersey. Drake, D., Grande, J. Assessment of Wildlife Depredation to Agricultural Crops in New Jersey. Journal of Extension. February 2002. Vol. 40. No.1. Singer, J.W., Meek, D.W. Repeated biomass removal affects soybean resource utilization and yield. Agronomy Journal. 2004. p. 1382-1390. Clayton Nielsen & William Porter. Special Issue: Ecology and management of deer in developed landscapes. Wildlife Society Bulletin. 2011. Vol. 35, Issue 3. American Farmland Trust. 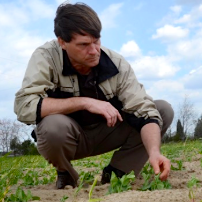 Fact Sheet: Why Save Farmland.